Going to the pool is a fun way to spend the day for the entire family. Unfortunately, though pools are great for recreation and exercise, they also come with the risk of injuries and even death in drowning accidents. Children are particularly susceptible to injuries related to swimming pools, as they may not be able to fully appreciate the risk of drowning. In fact, the Consumer Product and Safety Commission’s (CPSC) Pool Safety division reports that the second leading cause of unintentional death for American children is drowning. Due to the high risks of injury and death surrounding swimming pools, property owners, landlords, and other pool owners have a duty to keep pool areas as safe as possible for visitors. If a property owner fails to meet that duty and an injury occurs, victims have the legal right to hold that owner liable for the negligent acts. If you or your child has suffered injury in or around a swimming pool, you should contact an experienced Pittsburgh swimming pool accident attorney to discuss how you can recover for your losses by filing a personal injury or wrongful death claim. Have a barrier, such as a fence, around the pool area to keep out children who may be unsupervised from entering the area and falling into the pool. The fence must be regularly inspected for weaknesses, holes, or other spaces through which a small child may fit. Have a gate or other entrance to the area that may be locked or securely latched, and regularly maintain that lock or latch. Have appropriate depth markers and signs warning of risks or the lack of a lifeguard on duty. Maintain all surfaces in and around the pool so they are free from cracks or other defects that may cause slips, trips, or falls. Keep the area around the pool free from hoses, debris, or other obstacles that may cause a person to trip and fall into the pool. Make sure all drains are properly covered and in compliance with the Virginia Graeme Baker Pool & Spa Safety Act to avoid children from accidentally getting suctioned to drains. If owners fail to do any of the above and a person suffers injury or drowns as a result, that owner should be held liable for their negligent actions in court. 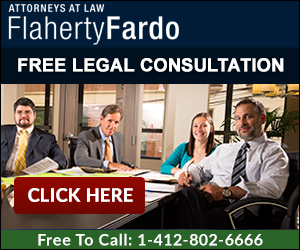 At the law firm of Flaherty Fardo, our attorneys understand how traumatic an unexpected accident can be for a family. Not only does a serious injury or death cause emotional trauma, but it may also have severe financial implications. Our experienced swimming pool accident lawyers are committed to making sure that accident victims receive the full amount of compensation they deserve for medical bills, lost benefits, pain and suffering, and more. If you believe you may have a swimming pool accident case, do not hesitate to contact our office today at 412-802-6666 to schedule your free consultation.